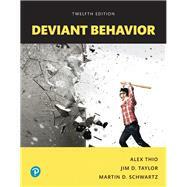 by Thio, Alex; Taylor, Jim D.; Schwartz, Martin D.
For courses in Deviance (Sociology). Deviant Behavior , 12th Edition puts readers in the driver's seat, letting them see what the experts have to say about the origins, causes, current state, and future directions of deviance. Providing a solid foundation in scientific theories of deviance, the text invites readers to apply theories and research to the most relevant forms of deviant behavior today, including emerging forms, such as hacktivism and virtual kidnapping. This extensively updated and revised 12th Edition takes a fresh look at time-honored topics, while shining a spotlight on cutting-edge innovations and deviance-related topics on the horizon. Alex Thio (pronounced TEE-oh), a sociology professor at Ohio University for over 30 years, unfortunately and quite unexpectedly passed away in May 2011. Although mostly known for his textbooks on deviance, introductory sociology, and social problems, with over a million copies in circulation worldwide, Prof. Thio also published a number of well-regarded research articles in a variety of professional journals. Born of Chinese parentage in Penang, Malaysia, in 1937, his family later moved to Indonesia, where he attended high school. There his school brilliance came to the attention of missionaries, and he was sent to the United States to obtain his bachelor’s degree at Central Methodist University in Missouri. Later, he did graduate work at Kent State University and received a doctorate in sociology from the State University of New York at Buffalo. He was hired in 1969 at Ohio University, where he taught hundreds of courses in deviance, introductory sociology, social problems, and criminology. In addition to teaching, he always enjoyed writing, and was an enthusiastic entrepreneur in his retirement. Aside from this book, he is the author of the popular text Sociology: A Brief Introduction, 7th Edition (2009), and with Jim D. Taylor, Social Problems (2011), along with several edited volumes. Prof. Thio dedicated his career to the advancement of the social sciences. His contribution and legacy are indelible, and we are honored to continue to advance his body of work. Jim D. Taylor is Associate Professor of Sociology at Ohio University Zanesville. A native Texan, Dr. Taylor received his Ph.D. in sociology from the Ohio State University. A lifelong motorcycle rider and enthusiast, hack songwriter/guitarist, bull rider, and former skydiver, Dr. Taylor specializes in the sociology of masculinity, deviant behavior, stigma management, and race relations. Dr. Taylor has published books on both American gun culture and social problems, as well as scholarly articles on the topics of stigma management and self-injury. His current research focuses on American rodeo cowboy culture and the intersections of rodeo sports, masculinities, and music. Prior to working in academics, Dr. Taylor managed the background investigation and silent witness divisions for the Wackenhut Corporation. In 2009, Dr. Taylor co-founded a dropout intervention charter school (The RCCS Everest High School) in the greater Columbus, OH area, enrolling former high school dropouts and at risk students. Over 200 former dropouts have graduated to date. Dr. Taylor has also worked with incarcerated students for the past decade. When not lecturing, conducting research, or writing, he loves to visit new campground destinations with his wife Katie, sons Graham and Charlie, and daughter Lily. Martin D. Schwartz is Professorial Lecturer of Sociology at George Washington University, and Professor Emeritus at Ohio University, where he served two terms as chair. He is the 2008 Fellow of the Academy of Criminal Justice Sciences, and has received distinguished scholar awards from the two largest divisions of the American Society of Criminology: Women and Crime, and Critical Criminology. At Ohio University he was named Graduate Professor of the Year and Best Arts and Sciences Professor, and was the first social scientist to be awarded the university’s research achievement award, the title of Presidential Research Scholar. He has written or edited (often with Walter S. DeKeseredy) 26 editions of 16 books, 75 journal articles, and another 75 book chapters, government reports, and essays. He has been a visiting scholar at the University of Melbourne in Australia and the National Institute of Justice in Washington, DC, and guest lectured in Europe, Australia, Canada, and throughout the United States. A former co-editor of Criminal Justice, he has served on the editorial boards of 11 other professional journals, while doing manuscript reviews for some 65 journals. He also was co-editor on two editions of the American Sociological Association’s publication Teaching the Sociology of Deviance. 1. What Is Deviant Behavior?